In this article we are covering TurboTax FreeFile program which is also a part of the IRS free file alliance. Earlier we have covered two tax software which can help you with free filing 1040.com FreeFileEdition and H&R Blocks Free File program. TurboTax is quite a popular tax service which is trusted by a lot of people. Like other free file programs this website also has a qualifying criteria for free file. If you qualify then you can file your federal as well as state tax return for free. Otherwise you can file paying very nominal charges. 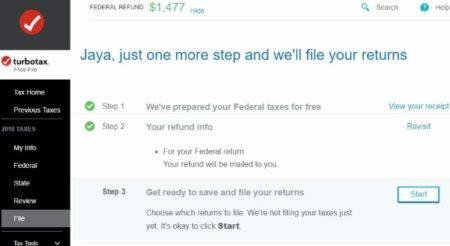 The TurboTax website is quite easy to follow. The home page of the free file program can be seen in the screenshot below. Right on the free file page of the website you will see a button which says “see if you qualify” for a free return. Click this button to check. You will be asked some questions, if you answer any of them as yes, you will be eligible for a free return. 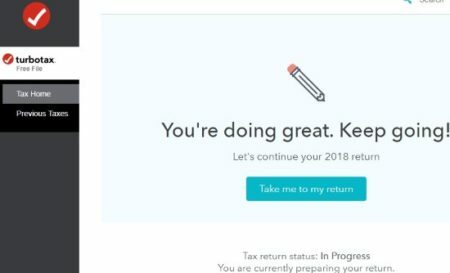 Now click the start TurboTax FreeFile program button. This will take you to a account creation page. Create a account by entering your email address, username, and a password. Now you will be directed to your dashboard which will look like the screenshot below. When you click the take me to my return you will be taken to the first section of the return which is personal information. Here you will be asked to fill in information like name, date of birth, social security number, phone number, occupation, residential state, etc. Once done, move on to the next section which is income. 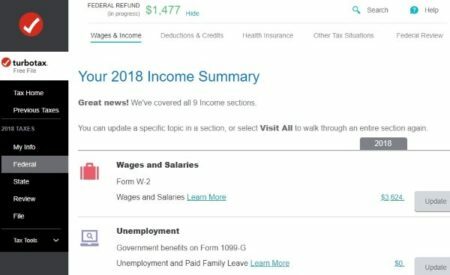 In income section, start by entering your W-2 information. If you have more than one W-2’s then you can enter information for each separately. Apart from W-2 income you have separate sections for other income like unemployment received, interest & dividend income, tax refunds, distributions received from social security or retirement accounts, rental income, business income, gambling winnings, jury duty, alimony paid, etc. Go through each section carefully, and answer the questions as the website asks. Once you are done entering income details, click the button at the bottom, which says “I’m done with income”. Now you will move on to the deductions and credits section. In this section you can either go through each section step by step, or choose which sections you want to go through. When you select the option to choose which sections to go through, then you are shown a consolidated list of all the sections, as seen in the above screenshot. Now from this screen you can choose which section is relevant to you and work on that section. Some common deductions and credits you will find under this section are property taxes, mortgage interest, home energy credit, child care, earned income credit, adoption credit, charitable donations, car registration fee, student loans, tuition, medical expenses, sales tax, IRA, retirement savings, employment expenses, tax prep fees, moving expenses, etc. 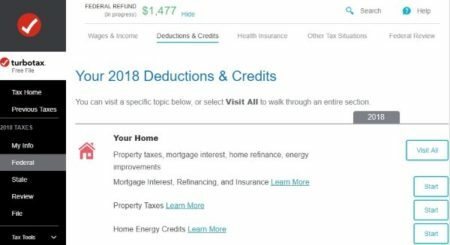 After you go through the deductions the website would suggest if standard deduction is better for you or you should go with itemized deductions. In this case the website suggested to go with standard deduction. After this comes the health coverage part. You have to answer some questions about your health coverage for the year. Once you are done with this section, you will be taken to the other tax situations section. In this section you can go through alternative minimum tax, business taxes, additional tax payments, etc. Now you are ready to review your federal return information that you have filled so far. Your return is going to be checked by the website for accuracy and if there are any concerns they will be shown to you. 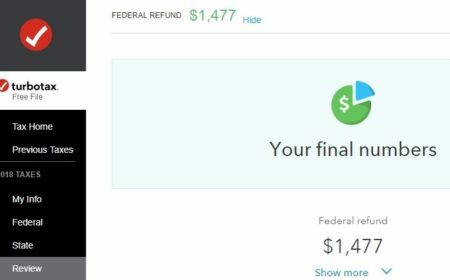 You will now be shown your federal refund amount, which has also been visible on the top left of the page. Now that you are done with federal taxes you can move on to state taxes. The next section is for state taxes. In case you qualify for free federal return you will also qualify for a free state return. Go through the questions as you did for the federal return. In the return I was using the state given was Texas and Texas doesn’t have any state income tax. So I didn’t go through that section. Now there is one final review performed on the information filled in so far. You will be again shown any concerns if there are any. Otherwise you will be shown your refund amount. After that the website will determine the best method for you to file your return. If you are eligible for the free efile then you can proceed with that. Otherwise you can pay some nominal charges to file your tax return. Now you need to choose if you want your refund amount as check or direct deposit to your account. In case of direct deposit provide the required information. Once that is done, now you can proceed to file the return by answering some additional questions. 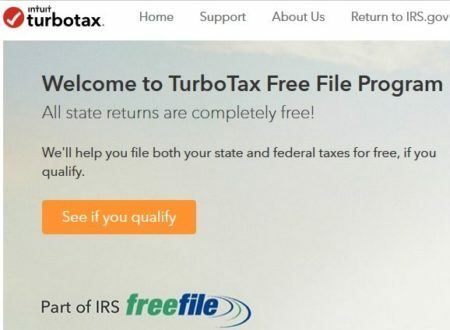 TurboTax Free File program has been around a while and is a trustworthy website. You can easily file your tax return using this website. Just follow the step by step guidance provided by the website and see if you qualify for a free return. Check out TurboTax Free File Program here.